Understanding The Workings Of A Burglar Alarm System | Calgary Alarm Inc.
Burglar alarm systems are common in all businesses and are becoming increasingly common in residential homes as well. The most important piece of information to know is that statistically speaking, homes are much less likely to be broken into with an alarm system, and particularly a 24-hour monitoring system, to accompany it. Consider that a residential break-in happens every 90 seconds in Canada. The importance of having an alarm system cannot be understated: the safety of your family matters and is something to be taken very seriously. 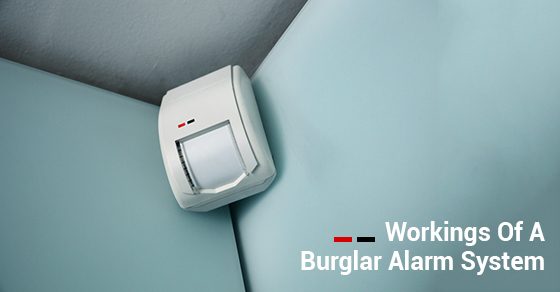 Acquainting yourself with the workings of a burglar alarm system will ultimately increase your security efforts. You will also have a better idea of how to prevent false alarms. A burglar alarm system can be understood by comparing it to turning on a light switch: a burglar’s movements will be detected by the switch and then activate an alarm. An entry level burglar alarm is an electric circuit that is built into a home’s entryway. All electric circuits must have a path between two opposite points of charge. To turn the electricity off, you open or close the circuit. In a burglar alarm, the switch will detect activity, such as an act of intrusion. These alarms are divided into both closed-circuit systems and open-circuit systems. In the latter, as long as the door is closed, electricity can flow from end to end. However, the circuit is opened once someone opens the door, eliminating the flow of electricity, which then triggers an alarm. Closed circuits are are normally better because intruders have the ability to deactivate open circuits by cutting the attached wires. In an open-circuit system, the act of opening the door closes the door, which promotes the flow of electricity. In this particular system, the alarm is triggered when the circuit is completed. Once the alarm sounds, the rest of the process is carried out by the motion sensor, which sends signals to the control box. The control box then sends a signal to the alarm device, such as a bell. This then deters the intruder from acting any further. Depending on your particular alarm system of choice, the control box can also notify appropriate emergency services such as the police department. Consider Calgary Alarms for your choice of alarm monitoring services—we are one of the best security alarm monitoring companies in Canada. Contact us today for more.